We don’t need to hear more. We don’t need a delay. The latest allegations against Brett Kavanaugh just further confirm what we already knew from Kavanaugh’s record — he is unfit to serve on the highest court in the country. This confirmation is anything but over. Republicans are still trying to rush this nomination through, and may vote as early as next week. His nomination should be withdrawn and the only way we can ensure that is to make it clear there aren’t enough votes to confirm him. Let’s #StopKavanaugh once and for all. 1. KEEP CALLING. Thank you so much for doing the work to stop this nomination, but also keep calling! Use Indivisible’s toll-free number 1-844-778-3056 and they’ll connect you directly to one of your senators. Call back and they’ll connect you with your other senator! 2. Share widely. Have you seen Indivisible’s latest video? Click to share it on Twitter and Facebook with your friends and more. Kavanaugh’s days as SCOTUS nominee are numbered, but only if we join together now and tell our senators Brett Kavanaugh has given us enough reasons to vote NO on his nomination. Notes: This week for the first time in history the National debt has surpassed 21 trillion dollars. Congress passed and Trump signed a suspension on the federal debt limit allowing the government to borrow an unlimited amount of money until March 1, 2019. 9/7/18. Portman will be voting Yeah on Kavanaugh this coming week. He both introduced him in the Senate and delivered remarks supporting him to the Judiciary Committee and the Senate. 9/5/18. Portman receives Beer Institutes 2018 Beer Champ Award based on his championing “common sense” tax reform. Now he can add them to his list of dirty campaign donations. 9/6/18. Remarks on Cincinnati shooting, “Jane and I are heartbroken about today’s shooting in our hometown….”. He offers thoughts and prayers, but never any remarks about common sense gun control. As a reminder, the NRA has given Portman over $3 million. The Senate Judiciary Committee has scheduled a vote for Thursday on SCOTUS nomination of Kavanaugh. If you are feeling frustrated by this, sign up for an Indivisible phonebank! We need a change in the Senate. Sign up for a shift to support progressive candidates and get out the vote around the country this November. There are plenty of shift times available and a training on Sept 12 if you are new to phonebanking! SCOTUS hearings start today, and we know where our Senators stand. Brown has committed to opposing Kavanaugh’s nomination, while Portman is firmly committed to supporting him. Otherwise, sign up to join an Indivisible phonebanking shift. These phonebanks are focused on reaching voters in key states, in effort to stop the nomination. Click on the link below to sign up for a shift (shift dates and times are available at the bottom of the form!). Register for an upcoming phonebank! If Trump is successful at getting Kavanaugh confirmed, the Court will work to preserve the Trump agenda for decades to come. Key issues that affect us all hang in the balance, including reproductive rights, access to health care, LGBTQ rights, environmental protections, and much more. How do we stop Kavanaugh’s nomination? 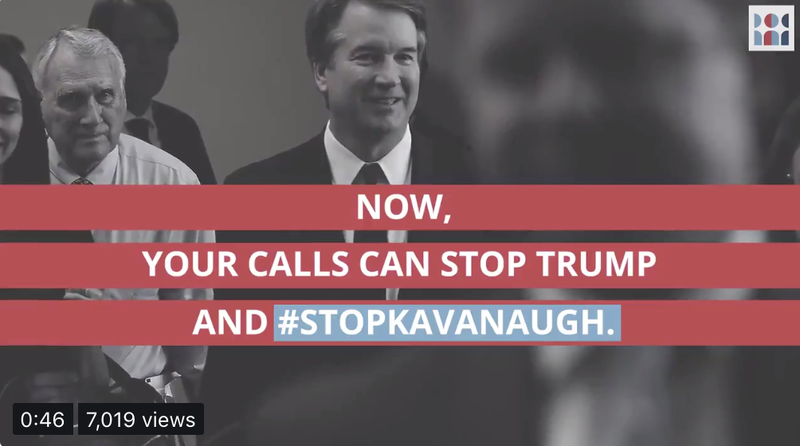 First, contact Senator Portman and ask him to oppose Kavanaugh’s nomination. Portman has come out in support of Kavanaugh and it’s important we let him know that his constituents do not agree. Use the call script below. Hi, my name is [NAME], and I’m a constituent from Dayton. I’m calling to demand Senator Rob Portman oppose Brett Kavanaugh’s nomination to the Supreme Court. Kavanaugh’s history of advocating for positions that are outside of mainstream beliefs are deeply troubling. His position that a sitting president should be shielded from criminal and civil action makes clear that Trump is attempting to subvert checks and balances to avoid accountability for his actions. [IF LEAVING A VOICEMAIL: please leave your full street address to ensure your call is tallied. Second, sign up to join Indivisible’s massive phone bank to flip the Senate that will run for the last 100 days before the midterms. This weekend, there was another mass shooting in Florida at a video game tournament in Jacksonville. How many more times will this happen before politicians act? The United States has more guns per capita than any other peer nation; Americans constitute about 4% of the world’s population but own 42% of all civilian firearms. On average, there is a mass shooting almost every day of the year in the United States, and the nation has far higher rates of gun homicides than any other developed nation. Firearm suicides in the US are also dismally common, with suicides actually comprising the majority of gun-related deaths. However, thanks to continued lobbying by the National Rifle Association (NRA), Congress has repeatedly failed to take meaningful action and curb gun violence. America’s disproportionately high rates of gun-related deaths are both tragic and shameful. Congress can save lives by passing common-sense legislation to reduce gun violence. Here are a few actions you can take today to support the fight to reduce gun violence and pass gun safety legislation. 1. Make sure the candidates you will be voting for in November support gun safety legislation. Find out which candidates have received the Moms Demand Action Gun Sense Candidate distinction by visiting this website. 2. Call your congressional representatives today and take this opportunity to demand that they oppose concealed carry reciprocity. Hi, my name is [NAME] and I’m a constituent from Dayton. The NRA is trying to gut our gun laws — putting our communities and our families at risk. I’m asking you to block the NRA’s extremist agenda of more guns in more places for more dangerous people, no questions asked. If the NRA gets their way, our state would be forced to abide by the weakest gun laws in the nation. The NRA wants to force all 50 states to recognize the decisions other states make about who can carry a gun in public — even rock-bottom standards that allow people who have never passed a background check or had any safety training whatsoever.And there’s nothing our state will be able to do about it. This policy — what they call “Concealed Carry Reciprocity” — is a dream for gun extremists and a nightmare for our state’s public safety. I urge you to stand with the majority of the American people, block concealed carry reciprocity, and fight back every time the NRA tries to gut our gun laws. The Senate is planning to begin committee hearings for Brett Kavanaugh’s nomination for the Supreme Court on September 4, and we need to keep up the pressure on them to vote no. Today, contact your senators and make it clear that Kavanaugh’s appointment is a threat to government accountability and the ongoing Mueller investigation. Hello! My name is ___ and I’m calling from [part of state]. The next Supreme Court Justice very well may hear cases that involve Trump himself, perhaps including cases stemming from the Mueller investigation or others related to Trump’s corruption and crimes. It certainly seems like Trump specifically chose Kavanaugh in order to shield himself from accountability, as Kavanaugh has extensively written about his extreme views on presidential power. He doesn’t think sitting presidents should be criminally investigated or indicted, and thinks they have wide latitude to fire Special Counsels like Robert Mueller. Donald Trump is a threat to our democracy, and Brett Kavanaugh would shield him from accountability. Will Senator [name] commit to opposing Kavanaugh’s nomination? Women Act (VAWA), landmark legislation first passed with bipartisan support in 1994, is set to expire on September 30th unless lawmakers pass a reauthorization bill. The act established the Department of Justice’s Office on Violence Against Women and provides funding for the investigation and prosecution of domestic and other interpersonal violence, stalking, and sexual assault. In July, Rep. Sheila Jackson Lee (D-TX) introduced a reauthorization bill that would not only reauthorize funding for VAWA’s existing programs but also establish new policies to help abuse victims remain in stable housing, expand red-flag laws to block people convicted of dating abuse or stalking accessing guns, and broaden protections against abuse for Native American women. The House is on recess until September 4th and will only have 11 legislative days to pass this critical legislation upon their return. While VAWA reauthorization has historically enjoyed bipartisan support, not a single Republican has co-sponsored the current reauthorization bill. Urge your representatives to stand up for women and reauthorize VAWA. I’m calling in support of H.R.6545, the Violence Against Women Reauthorization Act of 2018. Congress must act swiftly to pass this critical legislation to preserve funding for crucial programs protecting people from domestic violence, sexual assault, and dating violence. The Senate just announced that they’ll begin committee hearings for Brett Kavanaugh’s nomination for the Supreme Court on September 4. We need to make sure our senators know exactly where we stand on this issue. Brett Kavanaugh is already considered one of the most anti-environment judges in America. In decision after decision, he has demonstrated willingness to rule in favor of corporate polluters and slash public health safeguards. If confirmed, Kavanaugh will further gut the EPA’s ability to mitigate harm on the vulnerable communities most impacted by the climate crisis. The stakes to our environment are too high to let Kavanaugh be confirmed to the Supreme Court, and the most vulnerable are at risk – will [MOC] commit to voting no? The Department of Veterans Affairs (VA) is the second-largest government agency in the US. The VA has an annual budget of $186 billion, employs 370,000, and serves an estimated 20 million veterans. A recent report by ProPublica found that three members of Trump’s Mar-A-Lago golf club, who have neither government nor military experience, are secretly influencing the governance and operations of this massive agency. ProPublica reports that Ike Perlmutter, the CEO of Marvel Entertainment; Bruce Moskowitz, a physician; and Marc Sherman, an attorney, have acted as shadow administrators of the VA since Trump began his presidency. The so-called “Mar-A-Lago” crowd was instrumental in the ouster of former VA administrator David Shulkin and has assumed a direct decision-making role within the agency. The Trump administration has been embroiled in so many relentless scandals that it is hard to focus on any one. However, secretly handing leadership of the VA over to three golf club members represents staggeringly poor decision making and massive corruption at the expense of our country’s military service people. As Rep. Don Beyer (D-VA) stated, “Trump gave power to make decisions at the VA – affecting every US veteran – to three men who are neither government officials nor vets. Their only qualification: membership at Mar-A-Lago, for which they pay Trump.” The Veterans’ Affairs Oversight Committees in both the House and Senate must immediately investigate the “Mar-A-Lago Crowd,” how they came to power, and how they personally benefited from their role. The corruption of the Trump administration must not go unanswered. Hi, my name is [NAME] and I’m a citizen from Dayton. IF COMMITTEE, ADD I’d like to pass along a message to the Chairman and members of the committee. I’m calling to demand hearings and an investigation into the “Mar-A-Lago Crowd” VA corruption scandal. Three members of Trump’s golf club should not be allowed to secretly run the VA. Our veterans deserve better.